Blade Runner 2049 begins like the original: a silent black screen, upon which the stage is set via text. In both movies, the text’s quiet appearance tells a brief, nearly identical backstory: Humanity’s expansion to other worlds built upon the slave labor of bioengineered, “replicant” humans. Some models of these replicants have rebelled, leading not only to the prohibition of these replicants but of a special type of police officer: a blade runner. The blade runners seek out rogue replicants to “retire”—which we soon realize is a violent act, often involving a gun. Is it killing to destroy a machine? Is there a difference between replicant and human? This unfolds concretely as Deckard, Harrison Ford—the detective in the first movie, is asked at one point: “Have you ever retired a human by mistake?” He answers “no,” but he visibly agonizes after killing replicants. Every time ‘humanity’ appears defined, the films problematize it. A special test appears in the first movie in which a replicant’s pupils are measured during questioning—yet, already, this testing of emotional response fails. The more advanced replicants are implanted with memories which offer them emotional intelligence and depth. In Blade Runner 2049 this appears even further problematized, as the only characters who shed tears are the replicants. In fact, while the replicants of the new movie demonstrate remorse and sadness and love, most humans in the new film receive a cold, calculated, and mechanical portrayal. If emotions don’t offer a clear indication of humanity, a second option might be love, but this possible qualification of humanity also fails quickly. Two replicants who are villains in the first movie are deeply in love with one another; it’s their desire to preserve the life of their loved one that sparks their mission. And, we find a familial love deep enough to motivate the entire plot of the second movie. 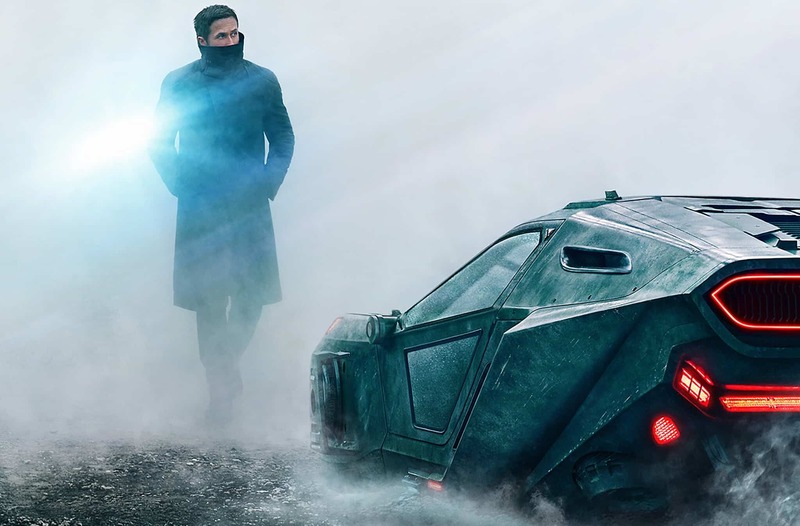 Blade Runner 2049 problematizes the idea love as a possible definition even further with the appearance of a holographic character. Ryan Gosling, a replicant, loves this hologram and she loves him in return. Courtesy of Junaidrao of the Flickr Creative Commons. The holographic woman’s last words—said as she tries to save Ryan Gosling’s character—are that she loves him. Even without a body, she can love… which leaves us questioning. We have no solid, immutable definition of humanity. Through ambiguity, omission, or contrary example—the movies problematize any clear answer to the questions. We spend half of the recent movie wondering whether Gosling is “born” or manufactured. And, we still never learn for certain whether Harrison Ford’s Deckard is a replicant or a human. In many ways, we cannot even be clear on the villains or heroes—replicants and humans alike seem capable of both love and of terrible cruelty. Those unanswered questions ruminate, offering two insights into the nature of humanity and life itself. They remind us that humanity is multifaceted and complicated—a mystery more akin to a miracle than to scientific criteria. Life, the miracle by which humans and the world are made, is something more than a list of checked boxes: it’s more than the presence of the biological, more than emotions or love, perhaps even more than we can explain. At the start of Blade Runner 2049, one replicant accuses Gosling’s blade runner, “You’ve never seen a miracle.” Unlike Gosling, the replicant has witnessed a birth and is left in unadulterated awe. Replicants and humans alike search for this mysterious child who was born demonstrating a shared commonality between them: a search for the meaning of life and our very human nature. Their search for a miracle motivates their action and sacrifice—it gives their lives meaning, yet it is never resolved or answered. Despite humanity and life never receiving a neat definition, something firm appears within the words of the replicant: “a miracle.” Perhaps, that is the key to understanding life and humanity within the Blade Runners: life itself is a mystery, a miracle to be held in awe. The cover photo is featured courtesy of Ron Frazier of the Flickr Creative Commons. Share ‘Blade Runner’: What Does It Mean to be Human?